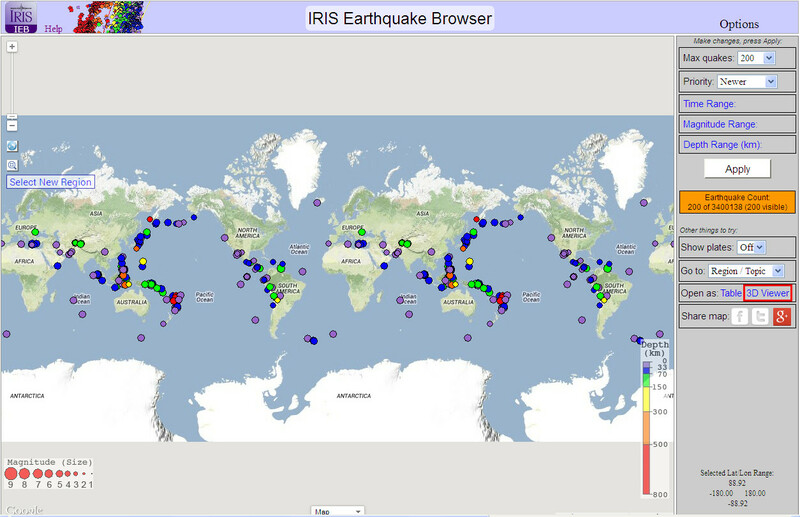 This tool provides an interface to the IRIS Earthquake browser. (IEB). It not only interfaces to the Map page but can also produce URL links for the 3D viewer and the HTML listing. This version adds map style selections (Hybrid, Road Map, Terrain and Satellite), some additional lat/lon parsing that is internal and the Map Caption now works. This help page applies also to the built in version of the IEB URL Builder in the QVSData programs from v2.4.64.0 onwards. The only difference is that the shapes maintenance is not done in the built in form. It is very simple and the minimum entry requirement is a minimum and maximum latitude and longitude. 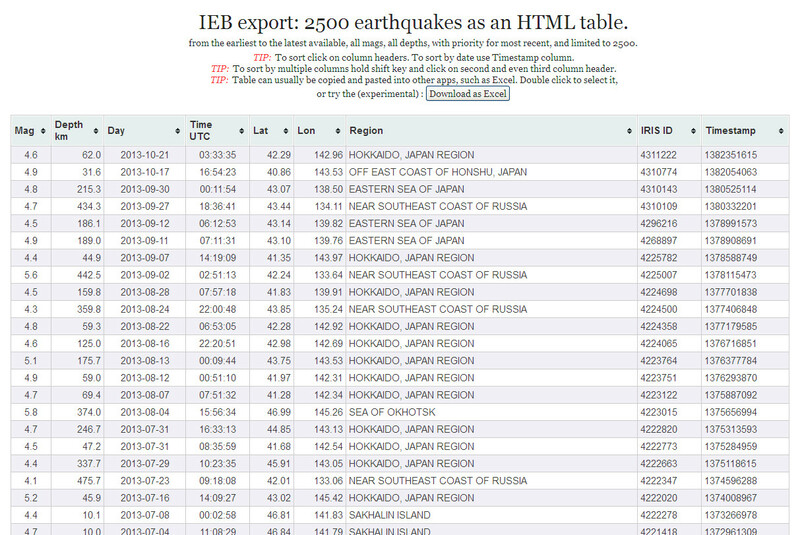 Of course that will not give a very useful set of data unless you want to see earthquakes from 1970 to present. Here for example is the opening IEB form with no parameters set. Whereas using the IEB on the web you would draw a selection area by dragging your mouse, the URL Builder allows you create the same selection but more accurately. If you wanted to select Greece you would need at least 2 bites at the cherry as on the front map the area is very small. You can of course also zoom in using the slider top right but even with that you will still need to drag the map to centre on Greece. Could be two or three or more ‘operations’ to get it as you want it. This is not a problem if you don’t know the coordinates of the area you want. However if you do you can enter them straight into the URL Browser and click Send. You achieve the identical results in a fraction of the clicks and mouse moves. By ticking the Send to All checkbox you can also get the 3D viewer and the HTML listing at the same time. There are three methods of getting coordinates into the latitude and longitude boxes. These boxes only accept decimal coordinates i.e. -20.3461, 161.0035 etc. Directly enter the coordinates you want in the boxes. Remember for longitude that the left hand box is the furthest West for your selection area irrespective of whether it is east or west of the meridian. Similarly the right hand box is the most Westerly coordinate again regardless of its relationship to the meridian. The entry below for example is perfectly valid. Copy and paste an epicentre’s coordinates into the box or boxes on the second tab. Unlike the first tab, the direct input, these boxes recognise the two different styles of coordinate naming. That degrees, minutes and seconds format will be converted to decimal. You can aslo use decimal NSEW format i.e. 20.3461 S, 161.0035 E or the EMSC notation 20.08 S ; 70.51 W which uses semi-colon. The important thing about these notations is that each element MUST be separated by a space. 38° 53′ 23″ N, 77° 00′ 32″ W works but 38°53′23″N, 77° 00′32″W will not. There are two numeric up and down controls. These have a minimum value of 0.5° and a maximum vlaue of 20°. Using the little arrows you can fine tune by 0.01°. There is also a Spread Slider. This is a coarse control that increments or decrements both numeric controls by 1° at a time. The limits of the slider are 1° to 15° thus at 15° you would get a selection area -7.5° and +7.5° in latitude and longitude from the epicentre entered. Similarly the main input tab would also have a message. Longitudes do not have such a warning and automatically wrap except for the time the resultant value is 180 or -180. If you continue sliding the warning will go. This also applies to entries on tab 1 as well that are added manually. If an entry is send to the IEB with a 180 or -180 value it will be changed to 179.9999 or -179.9999. The warning serves as a reminder of that. Better to spread across these boundaries that land directly on them. All you do is select the area you want and then click on ‘Fill the boxes’ which sends the stored coordinates, that you don’t see in this view, to the boxes on tab 1. You can adjust them there if you wish. Once the coordinates are entered all you need to add to the form are your selections for dates, magnitudes and depths and you can tailor the output to your precise requirements. While the ‘All Mags’ box is ticked (checked) the default of 0 to 10 will be used. If you untick the box you can then change the maximum and minimum values. Same goes for the depth values if the ‘All Depths’ box is unticked. When ticked the default of 0 to 900 is used. When unticked you can select. The default dates in the IEB are 01 Jan 1970 to 01 Jan 2025. If ‘All Available’ is ticked then this range will be used. If you untick the box you can select dates. The dates in the tool are set at today for the end date and today minus seven days for the start date. Please note that both dates are set at UTC so if you are a long way off from UTC in your time zone you may find that the end date is a day less or more than your home time date. The date box is a standard Windows control and can be edited in-line or using the drop down box. The year can be edited by clicking the year which shows a numeric up/down control. 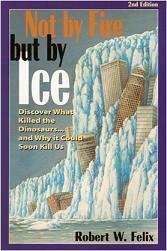 At present the IEB is restricted to a maximum of 5000 events. This is mainly due to browser considerations. This may change in the future when browser capabilities and machine specifications are sufficient to cope with greater numbers, but the IEB has been stress tested to 20,000 events. This determines whether the selection of events is ordered by the date or by the magnitude. When set to Newer it will order events by their date until the limit on the number of events is reached. When set to Larger the events will be ordered by magnitude until the limit on the number of events is reached. Adds the tectonic plate boundaries to the Map and 3D views. If you leave either of the boxes blank then you will get the default texts. If you make an entry in either box then what you enter will be passed to IEB. Finally you select what you want to output. You can send just the Map, or the 3d Viewer or the HTML List, or all of them or any combination of that. Just tick the appropriate boxes. All checks all the boxes on checking and deselects all except the ‘Send to Map’ on un-checking. Below that are three option buttons. You can select to just launch the URL to the browser, to save the code in the clipboard, or do both. If you have more than one type of URL selected then clipboard will only see the last URL to be compiled. The browser drop down allows you to select a browser other than the default for your system. Of course to use these they must be installed on your system in the ‘standard’ paths. If the program can’t launch the browser you selected it will default to the system default. If the system fails to launch the browser for that reason you can tell it that path. Click the minuscule little binoculars beside the browser dropdown with the browser dropdown containing the name you want to add the path to. Nothing will happen if the box says . Next you get a selection box that should have the right name and be in the right place but may not or you would not be having problems! Find the file and hit OK. The browser path is stored. Hit Send and it should go off and launch what you have selected. On the Manual Input tab the is a button ‘Save to list’. This will save the coordinates you have entered, and the number of events to display, to the Area Shapes file so you can recall this set as you wish. It is recommended that before saving the shape you test it. Let’s say that you want to look at Pakistan, Afghanistan and Tajikistan. (This will also take in Kashmir and part of NW India). Enter the coordinates in the boxes and set the number of events. I am using 2000 for this example. This gives an area in IEB that looks about what I want. Now I hit the ‘Save to list’ button and enter the name I want for the shape. The name is entirely your choice. The box will vanish when you click OK and if you then go to the ‘Saved and Popular Areas’ tab you will see that your shape has been saved. Unfortunately space if a bit tight but I may change that in the next version. It won’t actually be green until you hover over it with the mouse. Next you will see this dialogue box. If you click ‘Yes’ you won’t see anything happen, except the box goes away, but next time you open the program your shapes file will be replaced automatically – no questions asked! Removes the named shape in the selection box. The shape is also removed from the AreaShapes file with immediate effect. You will see this dialogue box when you click the button. This allows you to import a list of other ‘shapes’ that you have either created yourself or got from someone else. The format of the file is CSV and it can be saved as either a CSV or a Text file. Whichever you choose it must be plain text. Word processing files will not work. If the number of fields is wrong, determined by the commas, and any of the values except the first are non-numeric that line will be ignored. Your editor should then open. If you have questions or problems leave a comment. All comments are moderated and will not be visible until approved. No email data will ever be published even if you state the comment may be displayed. All comments will be displayed unless they contain personal information, are derogatory or otherwise not relevant, or if you specifically request that the comment no be displayed.